Welcome to The Abso!ute Sound online! We explore music and the reproduction of music in the home. We believe that the sound of music, unamplified, occurring in a real space is a philosophic absolute against which we may judge the performance of devices designed to reproduce music. Our goal is to provide the resources consumers need to judge how a component's sound either honors or departs from the music's truth, and to make sound purchasing decisions that maximize their experience of reproduced sound. Below is our Issue 184, September 2008 contents and editorial. Classical music is alive and well, as evidenced by Harmonia Mundi's 50th anniversary celebration. Andrew Quint brings you the inside story of this venerable record label. We assemble seven terrific-sounding systems to fit any budget. The stereo receiver comes of age in the Maven from Music Hall. Neil Gader reports. Anthony H. Cordesman evaluates the VPI Typhoon record-cleaning machine. Lyric HiFi's Mike Kay talks with HP about the early days of American high-end audio. Totem pulled out all the stops on this limited-edition speaker commemorating the company's 20th anniversary. Wayne Garcia has the details. This $1500 mini-monitor's advanced technology and pure beryllium tweeter pay off in the listening room, says Steven Stone. What's all this fuss about output-transformerless amplifiers? 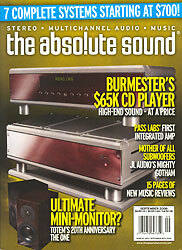 Sue Kraft auditions a pair of OTLs from that stalwart proponent of OTL amps, Atma-Sphere Music Systems. Pass Labs hits one out of the park with its first integrated amplifier, says Neil Gader. Alan Taffel on one of the most ambitious subwoofers ever made. This gorgeous two-box CD player from Germany's Burmester pushes more than a few boundaries. HP auditions the Zanden 1200mk2 phonostage and considers the problem of differing LP equalization curves. Schmidt: Das Buch mit sieben Siegeln. We interview genre-blurring rock artist Alejandro Escovedo. Plus, new albums from The Hold Steady, Coldplay, Wolf Parade, The Fiery Furnaces, Supergrass, The Baseball Project, Danny Paisley, Nachtmystium, and Gates of Slumber. Plus new archival releases from Billy Joel and Black Sabbath, and high-grade LPs from Fleet Foxes, Shearwater, and Neil Young. New discs from Willie Nelson and Wynton Marsalis, Bill Frisell, Wayne Horvitz, John Beasley, Mike Garson, Todd Sickafoose, and Joe Wilder-Marshall Royal Quintet. Plus, two more Music Matters 45rpm LP reissues. Two recordings of the music of Einojuhani Rautavaara, Wheeler's The Construction of Boston, Anne Sofie Von Otter performing Swedish songs, Sibelius' Kullervo Symphony, Lord's Boom of the Tingling Strings, a glorious Bach Motets, Jordi Savall's Estampies & Danses Royales, and the Zuckerman Chamber Players' take on Schubert and Mozart.